This IBM Redbooks publication describes and documents a number of different aspects of the Software Configuration and Library Manager (SCLM). 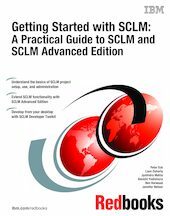 Part 1 of the book focuses on setting up an SCLM project using commonly used languages such as COBOL and PL/I. Additionally, migration techniques are discussed for those customers considering migrating to SCLM from other vendor Software Configuration Management products. Part 2 describes basic usage of SCLM functions such as Edit, Build, and Promote. Part 3 goes a bit beyond the basics and looks at some of the newer functions that are being added to SCLM, along with writing user exits and setting up SCLM for debugging with IBM Debug Tool. Parts 4, 5, and 6 concentrate on the SCLM Advanced Edition products such as Breeze, Enhanced Access Control, SCLM Developer Toolkit, and SCLM Administrator Toolkit. These sections describe what these products are and how they can be set up and used to aid your application development.